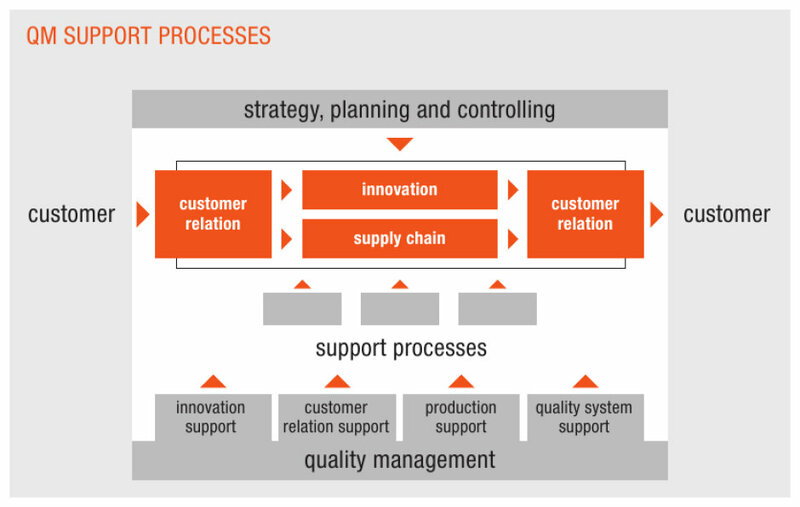 At OSRAM Opto Semiconductors we have been committed to the Business Process philosophy for years. To support this commitment, a Business Process Management system has been implemented that is tailored to our individual needs and meets external requirements as stated in quality standards, such as ISO 9001 or IATF 16949. Our process framework is composed of main business processes, management and support business processes. Main business processes are directly aimed at the fulfilment of our customers requirements. Customer Relations, positioned as the interface to the customer, reflects our quality policy and is a driving force for ourInnovation Process, which transfers our customers needs and expectations into technical solutions. Supply Chainfinally delivers these technical solutions and augments them with various services. Management and support processes are invisible to our customer, but are essential for controlling and handling our main business processes.